The Housatonic River (/ˌhuːsəˈtɒnɪk/ HOOS-ə-TON-ik) is a river, approximately 149 miles (240 km) long, in western Massachusetts and western Connecticut in the United States. It flows south to southeast, and drains about 1,950 square miles (5,100 km2) of southwestern Connecticut into Long Island Sound. Its watershed is just to the west of the watershed of the lower Connecticut River. Birds and fish who live in and around the river contain significant levels of PCBs and present health risks. Indigenous people began using the river area for fishing and hunting at least 6,000 years ago. By 1600, the inhabitants were mostly Mohicans and may have numbered 30,000. The river's name is derived from the Mohican phrase "usi-a-di-en-uk", translated as "beyond the mountain place" or "river of the mountain place". It is referred to in the deed by which a group of twelve colonists called "The Proprietors" captured the land now called Sherman and New Fairfield as "Ousetonack". Samuel Orcutt, a 19th-century historian, explained the term's pronunciation as "more properly...Howsatunnuck" and also noted an early spelling in the form of "Oweantinock". Prior to the 18th century, the river was alternatively known as the Pootatuck River. Accounts differ on the origin of this name, with some claiming that Pootatuck is an Algonquian term translating to "river of the falls" while others relate the term was eponymous, reflecting the name of the tribe that had their principal village along the river in the area of Newtown, Connecticut. "Pootatuck River" eventually came to refer a lesser tributary in the Housatonic watershed which empties into the Housatonic River at Sandy Hook, Connecticut. The river passes through land that was formerly occupied primarily by native people of Algonquian lineage, typically living in villages of two to three hundred families housed in hide wigwams. These native inhabitants burned the forests along the Housatonic Valley in the autumn to keep the underbrush down, a practice which was customary throughout Connecticut prior to European settlement. Housatonic river by Shelton at sunset. One notable native was Chief Squantz of the Schaghticoke tribe, who still hold a portion of the former reservation on the west side of the Housatonic River, in what is now called the town of Kent. English settlement of the northern Housatonic Valley began in 1725 in Sheffield, Massachusetts. By 1734, Mohicans established the Indian Town of Stockbridge, which grew over 15 years but then failed, with land pressures increasing. The river has been a source of power for paper, iron, textiles, and electricity industries. At Great Barrington, a grist mill built by David Ingersoll in 1739 used the river for power. The paper industry grew using the river's power from circa 1800. The river was dammed with the advent of industry. In 1900, there were 30 dams on the river in Pittsfield. Many have been removed, but many remain, such as the Woods Pond dam in Lenox, Columbia Mill dam in Lee, Willow Mill dam in South Lee, Glendale dam in Stockbridge, and Rising Pond dam in Great Barrington, Massachusetts. Inspired by the river during his honeymoon, the American classical music composer Charles Ives wrote "The Housatonic at Stockbridge" as part of his composition Three Places in New England during the 1910s, drawing his text from a poem of the same name by Robert Underwood Johnson. The town of Stockbridge is located in southwestern Massachusetts. The river enters Stockbridge on the east side of town before turning south toward Connecticut. There is an American nuclear weapon test of the same name, although it is not known if the name originated from the river or some other source. The United States Navy named a ship for the Housatonic River. The USS Housatonic has the distinction of being the first ship in history to be sunk by a submarine, the confederate vessel CSS H.L. Hunley. Three wooden covered bridges cross the Housatonic River. Two are in Connecticut: one known as Bull's Bridge, which spans the river between Gaylordsville and Kent, and another at Cornwall, known as the West Cornwall Covered Bridge. Reinforced with present-day materials, both bridges carry normal vehicle traffic, albeit in only one direction at a time. The third bridge, Old Covered Bridge located in Sheffield, Massachusetts, was destroyed by fire and rebuilt in 1998; it is now open only to foot traffic. Historically, the Housatonic River, and its Naugatuck River tributary, hosted the southernmost Atlantic salmon (Salmo salar) spawning runs. The Salmon Creek tributary of the Housatonic River may have been named for this salmonid, which can reach up to 30 pounds (14 kg). Cleanup activity at one of the GE Pittsfield plant Superfund sites. From circa 1932 until 1977, the river received PCB pollution discharges from the General Electric (GE) plant at Pittsfield, Massachusetts. The U.S. Environmental Protection Agency (EPA) designated the Pittsfield plant and several miles of the Housatonic as a Superfund site in 1997, and ordered GE to remediate the site. EPA and GE began a cleanup of the area in 1999. Most of the PCBs used in the United States during this period were made by Monsanto. Aroclor 1254 and Aroclor 1260, made by Monsanto, was a primary contaminant of the pollution in the Housatonic River. Although the water quality has improved in recent decades, and remediation has taken place, the river continues to be contaminated by PCBs. Additional remediation is planned, as of 2018. The highest concentrations of PCBs in the Housatonic River are found in Woods Pond in Lenox, Massachusetts, just south of Pittsfield, where they have been measured up to 110 mg/kg in the sediment. About 50% of all the PCBs currently in the river are estimated to be retained in the sediment behind Woods Pond dam. This is estimated to be about 11,000 pounds of PCBs. Former filled oxbows are also polluted. Birds, such as ducks, and fish that live in and around the river contain significant levels of PCBs and can present health risks if consumed. The Connecticut segment of the river is polluted with mercury levels far beyond background levels, starting at the confluence with the Still River. The hat manufacturing industry of Danbury, Connecticut, which operated from the 19th to the mid-20th century, was the source of most of this mercury pollution, from mercury nitrate used in the felting process. In the 21st century, the mercury remains in the river sediment and flows downstream, especially during storm events. High mercury levels are measured in the sediment at the outflow delta of the Housatonic River into Long Island Sound. The Housatonic River watershed drains 1,948 square miles (5,050 km2) in western Connecticut and Massachusetts and eastern New York. The Housatonic rises from four sources in far western Massachusetts in the Berkshire Mountains near the city of Pittsfield. It flows southward through western Massachusetts through the Berkshires and into western Connecticut, and empties into Long Island Sound between the cities of Stratford and Milford. The river's total fall is 1,430 feet (440 m) (959 feet (292 m) from the confluence of its east and west branches) to Long Island Sound. Its major tributaries in Massachusetts are (heading downstream) the Williams River (in Great Barrington), Green River and Konkapot River (in Ashley Falls). Crossing south into Connecticut, the Housatonic's major tributaries are the Blackberry River (in Canaan), Salmon Creek (below Falls Village), Ten Mile River (above Gaylordsville but originating in New York), Still River (south of New Milford), Shepaug River (at the Bridgewater and Southbury border), Pomperaug River (at Southbury), and Naugatuck River (in Derby). The Naugatuck River is the Housatonic's largest tributary with a contributing watershed of 312 square miles (810 km2). Five dams impound the river in Connecticut to produce hydroelectricity: the Falls Village, Bulls Bridge, Shepaug, Stevenson and Derby dams. The last three dams form a chain of lakes: Lake Lillinonah, Lake Zoar and Lake Housatonic, from New Milford south to Shelton. View of the "fly fishing and paddling" section of the river during a snowstorm. Surrounding forests are still wild and support animal life despite the threat of suburban encroachment. The Housatonic River is a popular whitewater paddling destination beginning at Falls Village, Connecticut and continuing to Gaylordsville. Most of the river is quickwater and Class I whitewater with long sections of Class II-III whitewater. A deadly and extreme Class VI resides at Great Falls in Canaan (Falls Village) and is most likely not able to be paddled. The most dangerous and difficult section that is navigable is by Bulls Bridge, with Class V whitewater. There are several minor and major dams along the river that form lakes. Most notable are two lakes in Connecticut, Lake Zoar, which borders Monroe, Newtown, Oxford, and Southbury, and Lake Lillinonah. Both lakes are major water-sport recreation outlets for the surrounding towns. Two of the three lakes formed by the dams are used for rowing by clubs, schools, and to host regattas. Lake Lillinonah is used by the GMS Rowing Center and is host to the GMS Regatta. Lake Housatonic is used by the Yale University Crew Team and the New Haven Rowing Club and is host to the Derby Sweeps & Sculls and the Head of the Housatonic. The Housatonic River is also a popular fly fishing destination. Fly fishing on the Housatonic River (which is strictly catch and release) has been compared with western rivers and is among the finest for trout in the eastern United States. The most popular area for fly fishing is in Litchfield County, Connecticut between the dam at Falls Village and the Cornwall Bridge. The Appalachian Trail follows the river along this section from the Bulls Bridge covered wooden bridge near Kent to Falls Village. ^ a b "Housatonic River". Geographic Names Information System. United States Geological Survey. ^ "Feature Detail Report for: Salmon Creek". USGS Geographic Names Information System. USGS. Retrieved 27 June 2016. ^ a b c Housatonic River Basin Final Natural Resources Restoration Plan, Environmental Assessment, and Environmental Impact Evaluation for Connecticut (PDF) (Report). State of Connecticut Department of Environmental Protection, USFWS, NOAA. July 2009. Retrieved 2014-11-09. ^ a b "Rest of River of the GE-Pittsfield/Housatonic River Site". Retrieved 25 September 2015. ^ a b "Understanding PCB Risks at the GE-Pittsfield/Housatonic River Site". EPA. Retrieved 27 October 2015. ^ a b "General State-wide Advice for Eating Recreationally Caught Fish and Waterfowl In Massachusetts" (PDF). www.mass.gov. MDPH. Retrieved 28 October 2015. ^ a b c d e f g h "A Paddling Guide to the Housatonic River in Berkshire County" (PDF). HVA Today. Housatonic Valley Association. Retrieved 1 October 2015. ^ a b Housatonic Valley Association. Cornwall Bridge, CT. "History of the Housatonic Valley." Accessed 2015-10-1. ^ a b Simon, Irving B. (1975). Our Town: The History of New Fairfield. New Fairfield, Connecticut: New Fairfield Bicentennial Commission. p. 5. ^ Orcutt, Samuel (1882). The Indians of the Housatonic and Naugatuck Valleys. Hartford: Case, Lockwood & Brainard. p. 108. Retrieved 10 November 2015. ^ a b Raacke, Peg (April 28, 1977). "Town History: Housatonic Valley Indians". Citizen News (New Fairfield). ^ Cothren, William (1854). History of Ancient Woodbury, Connecticut, from the first Indian deed in 1659 ... including the present towns of Washington, Southbury, Bethlehem, Roxbury, and a part of Oxford and Middlebury. Waterbury, Conn.: Bronson Brothers. p. 11. Retrieved 13 October 2017. ^ "Pootatuck River & Deep Brook - Nutmeg Trout Unlimited". Nutmeg Trout Unlimited. Trout Unlimited: Nutmeg Chapter. Retrieved 13 October 2017. ^ Silverberg, J. (June 1979). The History of Squantz Pond State Park, New Fairfield, CT. New Fairfield, Connecticut: manuscript from New Fairfield Free Public Library. ^ Tomaino, Peter (1985). Chronology: Under Candlewoods, Roots at Squantz Pond. West Cornwall, CT: EARTH ONE. ^ Massachusetts Covered Bridges - Upper Sheffield Bridge. Coveredbridgesite.com. Retrieved on 2013-07-15. ^ Kendall, W. C. (1935). The fishes of New England: the salmon family. Part 2 - the salmons. Boston, Massachusetts: Memoirs of the Boston Society of Natural History: monographs on the natural history of New England. p. 90. Retrieved 2014-10-08. ^ U.S. Environmental Protection Agency (EPA). Boston, MA. GE/Housatonic River Site in New England: Site History and Description." Archived 2011-05-19 at the Wayback Machine 2009-11-12. ^ "Understanding PCB Risks at the GE-Pittsfield/Housatonic River Site". EPA. Retrieved 25 September 2015. ^ a b c Gay, Frederick. "Distribution of Polychlorinated Biphenyls in the Housatonic River and Adjacent Aquifer, Massachusetts" (PDF). USGS. Retrieved 25 September 2015. ^ "Cleaning up the Housatonic River". EPA Cleanups: GE-Pittsfield/Housatonic River Site. EPA. 2018-04-30. 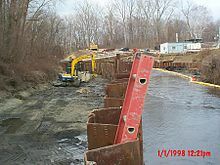 ^ "Former Filled Oxbows of the GE-Pittsfield/Housatonic River Site". EPA. Retrieved 1 October 2015. ^ "If I Catch It, Can I Eat It? A Guide to Eating Fish Safely - 2015 Connecticut Fish Consumption Advisory Site" (PDF). Connecticut Department of Public Health. Archived from the original (PDF) on 7 September 2015. Retrieved 28 October 2015. ^ Lerman-Sinkoff, Sarah (April 2014). "Transport and Fate of Historic Mercury Pollution from Danbury, CT through the Still and Housatonic Rivers". Middletown, CT: Wesleyan University. Bachelor of Arts thesis. ^ Varekamp, Johan (2002-06-25). "'Mad Hatters' Long Gone, But The Mercury Lingers On". UniSci. Cape Coral, FL: UniScience News Net, Inc.
^ Verekamp, J.C.; Buchholtz ten Brink, M.R. ; Mecray, E.L.; Kreulen, B. (Summer 2000). "Mercury in Long Island Sound Sediments". Journal of Coastal Research. 16 (3): 613. JSTOR 4300074. ^ GMS Rowing Center. New Milford, CT. "About Us/Vision." Wikimedia Commons has media related to Housatonic River.